I am an awkward person. I guess it comes from being a very shy person by nature but whatever the reason I have problems communicating with strangers. I just don’t fall into that easy coolness that some people can pull off. For me it is a struggle to make idle conversation. The result of this deficiency is that I tend to over compensate when I am in a situation that requires some kind of discussion with a total stranger. Of course the ultimate result is that I often find myself putting my foot in my mouth. This probably goes a long way to explaining why I have never had an overly large stable of friends or social acquaintances. What is important to note is that I suffer from regular attacks of extreme douchebaggery through no conscious fault of my own. Thursday night I had one of these attacks. For weeks I had been looking forward to seeing Max Brooks at UAB. 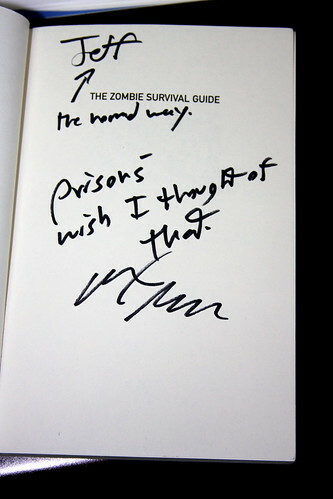 Max Brooks, for those of you that are unaware, is the author of World War Z and The Zombie Survival Guide. World War Z is structured as a non-fiction account of the zombie apocalypse. The Zombie Survival Guide is basically exactly what the title says it is. Both books, I believe, have been bestsellers. I read World War Z last year and have owned the survival guide for a while but never got very far in it. Pay attention to that folks for it plays a big part in what is to come. I enjoyed World War Z and was really excited to attend the lecture and book signing. Thursday night rolled around and I gathered my books and headed out. The lecture was fun and filled with great moments. After an hour had passed, the main event ended and it was off to the signing. Somehow I managed to find myself at the very end of the line. Again folks, this is important so pay attention. As I stood in line, by myself I had plenty of time to think. Always bad news. I started thinking about Mr. Brooks and how boring it must be to sign a few hundred books and try to make the few seconds he has with each person mean something. This lead me to try and come up with something to say to him that might be unexpected and original. Of course, I am neither unexpected or original so you might guess how this is going to turn out. Some of you may already notice the faux pas. As Mr. Brooks continued thumbing through the book muttering “Kirkman’s Idea eh?” I realized my mistake. Well, several mistakes actually. #1. I had not thought to check when any of the Mr. Brooks books were published in relation to the comic books. #2. While I had not finished the survival guide I decided to ask a question that would most likely be covered in the book. #3. Instead of asking a question about Max Brooks, his writing, his work in television or even his father, I asked a question about a completely unrelated author of similar material. All of these are probably bad but taken together it really made me look like an idiot. You see, the survival guide was published in 2003 and contains a section on prisons. Kirkman’s book also began its run in 2003 but the prison storyline did not start until around issue #12 published in 2004. So, me asking about “Kirkman’s idea” was pretty ridiculous. Max, I can call him “Max” now right? was much cleverer than I and signed my book so that I will never forget my mistake. We spoke a moment about Kentucky, which came up due to a conversation with the gentleman standing behind me in line. Of course I couldn’t stop myself and pointed out that Robert Kirkman is also from Kentucky. Ooopppsss again. Seriously folks, when I do it, I do it all the way. No half assed douchebaggery for me. No sir. I give 110% percent. It was at this point I decided to just shut up. Probably the best thing to do really. 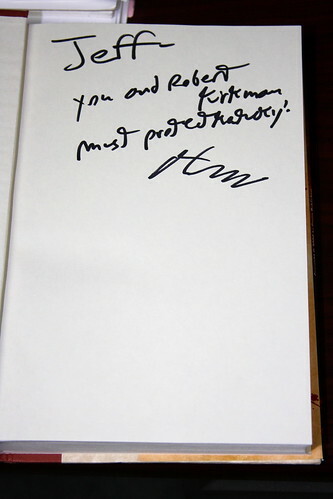 Max signed my other book and completed the coup de gras by adding insult to injury in making doubly sure I will never forget what I shall call ‘the “The Incident” from now on. 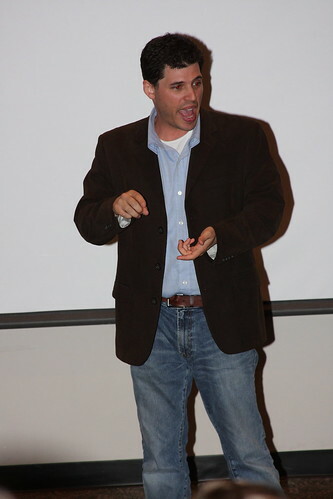 Thank you for taking time to come and visit the University of Alabama at Birmingham on October 29, 2009. Your talk was both entertaining and informative and I am extremely happy to have had the opportunity to attend. I regret to admit that when I had the brief opportunity to speak with you I proceeded to make a complete jerk of myself by bringing up a writer who may or may not have borrowed some concepts from your work for his own. It was foolish of me to try and be clever when I had, in fact, not digested all of The Zombie Survival Guide. I made an assumption which proved inaccurate and followed it up with other statements that proved how little of the book I had actually read. It is with this realization that I most humbly request your forgiveness for my brazen and heinous act. The Zombie Survival Guide: Recorded Attacks at my earliest opportunity. I also resolve not to support insane concepts like using shotguns and swords with names like Narsil and Anduril when combating the zombie hordes. Furthermore I offer my services as an outdoor enthusiast should you ever need such skills in your “group” (so long as you stay away from my orifices). If this apology is not acceptable then I certainly understand. Some insults can never be forgiven. In that case, I respectfully ask that you stomp me out with your Imperial Walker at your convenience. Wow. Epic awkwardness. Good story, though. I sent this to Max! Let me know if you hear from him! Epic awkwardness yes, but completely par for the course where I am concerned. Pretty standard for me. Probably explains why I generally avoid opening my mouth in public. Jason: Thanks. Hope he enjoys it!